Our energy world is undergoing a radical transformation as we change the way we consume and generate energy. Renewables, including solar, while currently contributing only 2% of world electricity consumption, are becoming an increasingly larger portion of the energy equation making up 70% of new capacity in 2017. At the same time, a large number of traditional coal-based power plants are being retired which means renewables occupy a larger portion of the production capacity, rendering the grid less stable and predictable than when running on 24/7 fossil fuel consumption. As our energy generation is transitioning, so too are our consumption patterns as more people embrace the entrance of IoT devices, smart homes and electric vehicles. This means that the electric grid requires new flexible solutions to support this new era of energy generation and production. In order to implement a flexible grid, there are a number of factors that need to be considered. Through the aforementioned transformation, overall energy generation based on solar energy will more closely follow the PV bell curve versus the duck curve which is solely based on energy demand. This will have a number of effects on how energy is managed at the macro level. Since solar energy is intermittent and consumption patterns differ from production patterns, the base load needs to instantly ramp up and down. Since this ramping up and down is particularly burdensome on the grid, there needs to be a means to shift demand and supply patterns so they are more aligned throughout the day. This is because some of the peak energy demand times are not at the same time as standard PV generation. It will be the role of distributed battery storage and water heaters to ensure that energy is available during the times it is most needed and used. Equally, consumption patterns will shift according to the time of PV production, thanks to smart energy management. This includes household loads and EV charging. Given the large diversity of different loads and distributed energy resources, any solution designed to support the grid will need to support a very diverse load mix in order to offer maximum flexibility. Any deployed solution for grid management needs to offer affordable control configuration. Just as much of the world is moving from hardware-based control to cloud-based for cost savings, so too should any grid management tool. Hardware or on-premise solutions have many hidden costs beyond the original cost of the hardware itself, such as installation, maintenance, upgrades/replacements and additional data links. The main costs with cloud-based solutions are incurred from the initial licensing fees and any setup or integration charges. The cost-effectiveness of cloud-based solutions compared to local-control systems accelerates the adoption rate of new technology and improves its ROI, which will enable the grid to catch up to the new energy reality. Inexpensive, available and reliable communication is an additional key requirement for any type of grid solution to be able to communicate and control all distributed energy resources (DERs) like solar PV systems, storage, EV chargers and more. The most common communication methods for DERs are ethernet and cellular network. The prices of both broadband and mobile data are declining while their coverage and reliability are improving. With this strong communication infrastructure in place, any grid solution should leverage these communication networks. Also key in terms of communication is the ability to communicate with a variety of different types of systems, interfaces and protocols. This type of interoperability is key for integrating PV, EVs, batteries, thermostats, sensors, switches, capacitors and water heaters into one control platform. Just as machine learning, partial autonomy and artificial intelligence are becoming a larger part of our everyday lives, so too should they be integrated into energy control platforms. Advanced analytics and machine learning can help plan for more flexibility and increase predictability to enable PV generation and load forecasting. In addition, there are certain types of events that need a fast frequency response and require local autonomy or grid-edge computing. When controlled by platforms with partial autonomy, our grid can become increasingly efficient, flexible and smart. While a distributed grid can offer more security, especially against a physical attack, it can also allow for additional access posts. This coupled with cloud-based systems requires a new level of cyber protection. Cyber security needs to be implemented at all levels — inverter, IoT, server and platform — in order to protect the grid. The flexibility of any given solution must not compromise its security. There are already a number of flexible grid services solutions available in the market. However, many of these solutions are missing one of the key links between this high-level solution and its implementation — the solar inverter. 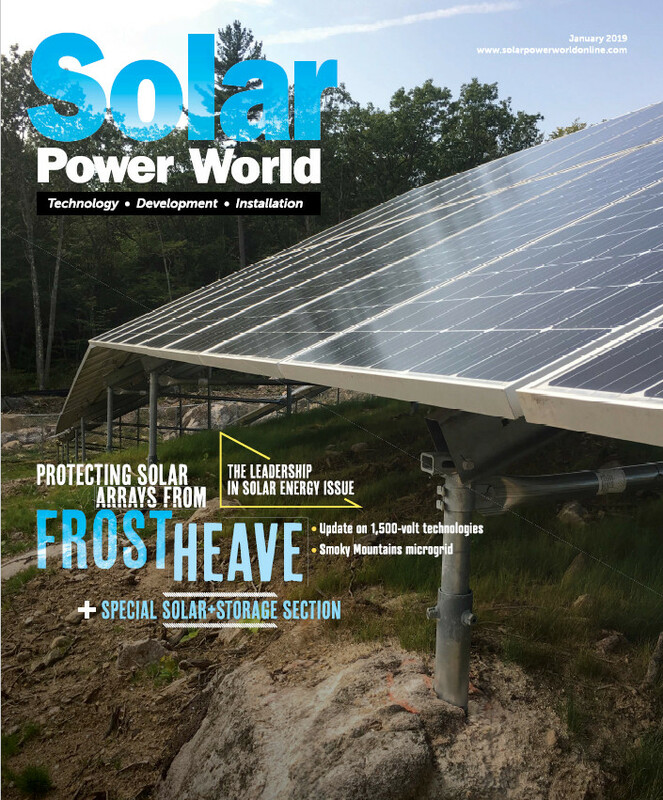 The PV inverter should serve as the linchpin that connects all of the distributed energy resources with any grid platform. Smart inverters are well positioned to provide the required systematic flexibility, such as grid sensing, smart energy management, cellular/ethernet communications, and advanced computing and memory capabilities. With PV inverters being the link to a smarter grid, it is reasonable to assume that their progress will lead the evolution of the entire grid.